SHARJAH, United Arab Emirates--(BUSINESS WIRE)--In response to the challenges facing Youth in the MENA region, Sharjah, the third largest emirate in the United Arab Emirates, has called on MENA member states and international community to collectively adopt and implement the ‘Sharjah Declaration for Youth Empowerment’, a nine-point action agenda to empower youth, and save their futures from the dangers of extremism. Put the acquisition of life skills at the centre of youth policy decision-making to prepare children and youth to leap into the future: ready to learn, engage in employment, be active citizen and in control of their own personal growth and empowerment. Promote policies that foster an enabling environment and recognise the important role of young women as agents of economic stabilisation and growth. Mainstream gender in all plans, policies and programmes which are aimed at empowering, protecting and supporting youth. Utilise existing endeavors towards education reforms, and the changing demographics as a window of opportunity to translate investment in human capital. Coordinate efforts of governments, UN agencies, NGOs, academics and the private sector to transform education to enable flexible learning opportunities beyond schooling. Note that youth entrepreneurship is a driving force of socio-economic development. Act to create conditions conducive to youth entrepreneurs. Ensure that all refugee youth are protected against violence, abuse, and exploitation, and to have access healthcare and psychosocial support. Take the best interests of refugee youth as a primary consideration in all matters affecting their future. 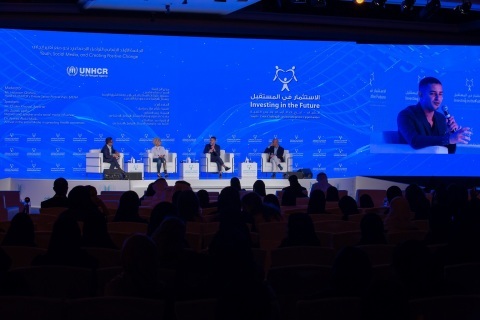 The declaration is the outcome of a full day of discussions at the Investing in the Future Conference (IIFMENA), which is organised by global humanitarian organisation, TBHF, under the theme, ‘Youth – Crisis Challenges and Development Opportunities’ offering its global platform once every two years to address a pressing humanitarian problem in the region. Arab Youth called on MENA member states and international community to collectively adopt and implement the ‘Sharjah Declaration for Youth Empowerment.